Tales from a tribble: Allegro Con Spirito -- You Bet! Allegro Con Spirito -- You Bet! It is almost hard to believe that Johannes Brahms, the great German Romantic composer and pianist, agonized many, many years before he could complete his first symphony. Brahms let the shadow of Beethoven hang over him knowing his first symphony would be compared to those symphonies of the great master. Brahms was afraid he couldn't meet those standards of greatness. 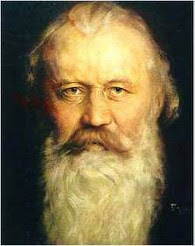 When Brahms finally completed his first symphony it was not only compared favorably to Beethoven's symphonies but it was referred to, by some critics, as Beethoven's 10th symphony. While it took Brahms a long time to complete his first symphony, he was able to complete his next three symphonies in rapid fashion. His four symphonies can all be ranked near the top of the symphonic repertoire. They are all truly magnificent. The fourth movement of Brahms second symphony is marked Allegro con spirito: which means fast, lively and played with spirit. In this video you will see that spirit from this orchestra. There are times in this movement you almost think the orchestra members are going to come out of their chairs. I think you will love not just the ultra beautiful music of Brahms, but also the visual. What a great symphony with an exhilarating climax. The movement starts out calm enough for the first 30 seconds, but then the spirit takes over...or should I say the spirito takes over, you bet! So, while I usually tell you to turn up the volume and sit back and listen to the music, in this case I am not only asking you to turn up the volume but also play in full screen to visualize the emotions of this great orchestra playing "con spirito". In a Tales bonus, I would love for you to hear the warm, meditative second movement from this great Brahms symphony. [from the same conductor and orchestra] No, this one is not marked Allegro con spirito, but Adagio non troppo. I think you will agree with me this slow movement is truly beautiful music. Once again for this bonus Tales classical music coverage, please turn up the volume and enjoy. Tales bonus 2: Here is another example of allegro con spirito in this first movement of the great Spanish composer Joaquin Rodrigo's famous and popular, "Concierto de Aranjuez". This is a unique concerto for guitar and orchestra, and it is beloved by concert fans. note: Aranjuez is a part of Madrid, Spain so the name of the piece means Concerto from Aranjuez, Madrid. Once again, please turn up the volume and enjoy!